All you need to know if you're visiting Stevens Lodge for the first time! And come now, we're open December 23 - January 1. For many Mountaineer members, a trip to one of our properties is a new experience. I can assure you, once you visit, you'll want to make it part of your winter program all winter long! For those who want to visit us at Stevens Lodge, there are a few things that are helpful to know. When you get to Stevens Pass, you'll want to look for Lot 4 on the west side of the ski area (it'll be your first lot on the right if you're coming from Stevens, and the second lot on the left if you're coming from Leavenworth). Stay left at the fork, and follow the signs to Lot 4, snaking up and around the hairpin turn. Park against the snow wall. The trail to the cabin is adjacent to the shipping containers. Head up the trail, take a right, and follow the trail until you see the lodge. You'll need a warm sleeping bag, layers for the lodge, and your toiletries. And of course your winter ski/board/sled/snowshoe gear! We have mattresses in our co-ed bunk rooms. Our locals like to bring down booties to wear around the lodge too. If you haul your skis to the lodge, you'll be able to ski directly to the lifts in the morning. We have a gear room on the lower level to store and dry your wet gear when you're not using it. Breakfast and dinner are served Saturday, and breakfast is served Sunday for normal weekends. You are welcome to bring supplies to cook your own dinner on Friday, and you'll need to take care of your own lunches. We just ask that you clean up after yourself. For drinks, we ask that alcoholic beverages are consumed on the porch or discreetly indoors. We have warm beverages for purchase. The lodges are famous for asking our guests to help out with lodge chores. We run off of volunteer labor, and your stay is partially subsidized by your willingness to participate in cleanup. This can be as easy as washing dishes or shoveling snow. Ask the Cabin Manager on duty if you have questions. We offer discounted lift tickets for our guests. These enable you to ski right to the gate in the morning. To ski home, follow Brennan's Trail and look for the first two trails into the trees. 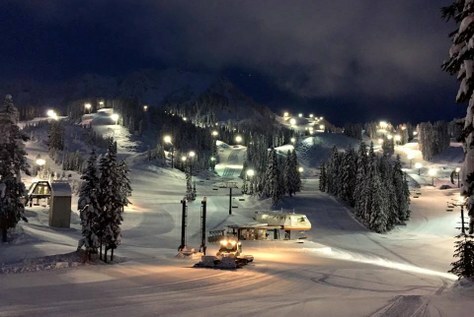 Night skiing is big with our crew so don't be shy about asking to join us after dinner. If you've never stayed with us, make this the year to check out what you have available for you, just 90 minutes from Seattle!